Is there a better alternative to MacGourmet:Mealplan? 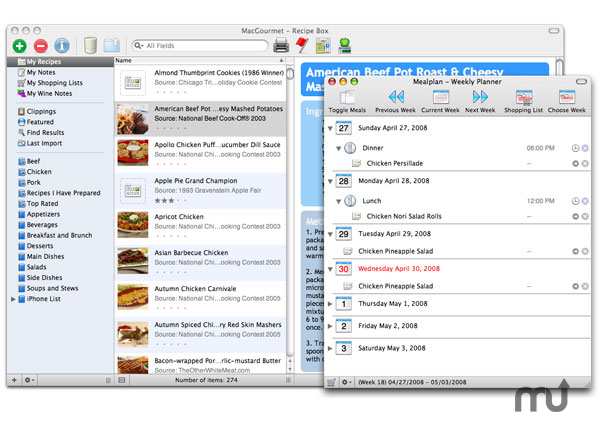 Is MacGourmet:Mealplan really the best app in Cooking category? Will MacGourmet:Mealplan work good on macOS 10.13.4? MacGourmet:Mealplan... Are meal planning and menus are an essential part of your culinary life? Well with the optional Mealplan plug-in, you can add these features to your copy of MacGourmet. Mealplan has all sorts of things that make your meal planning a breeze: it adds a drag and drop weekly planner that makes it easy to organize meals for your entire week. With the weekly planner, making a shopping list for your week is just a button press away. Mealplan also adds a way to create menus for your meals too. Finally, print out a planner for your entire week, so that you can see "what's for dinner," at a glance. Updated localizations for German, Italian and Danish. MacGourmet:Mealplan needs a review. Be the first to review this app and get the discussion started! MacGourmet:Mealplan needs a rating. Be the first to rate this app and get the discussion started! Save $2 for a limited time by using the coupon code MEALPLANPROMO when ordering.